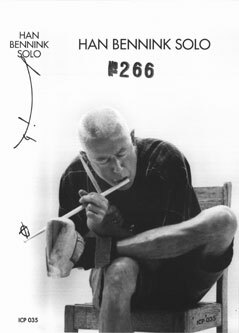 Han Bennink, drums, percussion, voice. This is a video of approximately 25 minutes directed by Wouter Hasebos and featuring Han Bennink playing drums and percussion in the studio. It also features a number of Han Bennink's art works. The video was released in summer 2000 and produced in a limited edition in PAL and NTSC formats. No details of recording date or place are provided. Cover photograph (reproduced above) by Hugo Gosse.